I’m making history here today with this post… My very first non-alcoholic drink I’m writing about. That is, if you consider this Strawberry Rhubarb Float a drink (maybe it’s more of a dessert!). I originally made some strawberry rhubarb mint simple syrup to use in cocktails but for some reason, today I decided ice cream would be much better in the drink than vodka! Shock, I know. But perhaps you didn’t know that ice cream is my all time FAVORITE thing to eat, and who doesn’t love vanilla ice cream with strawberries and rhubarb? 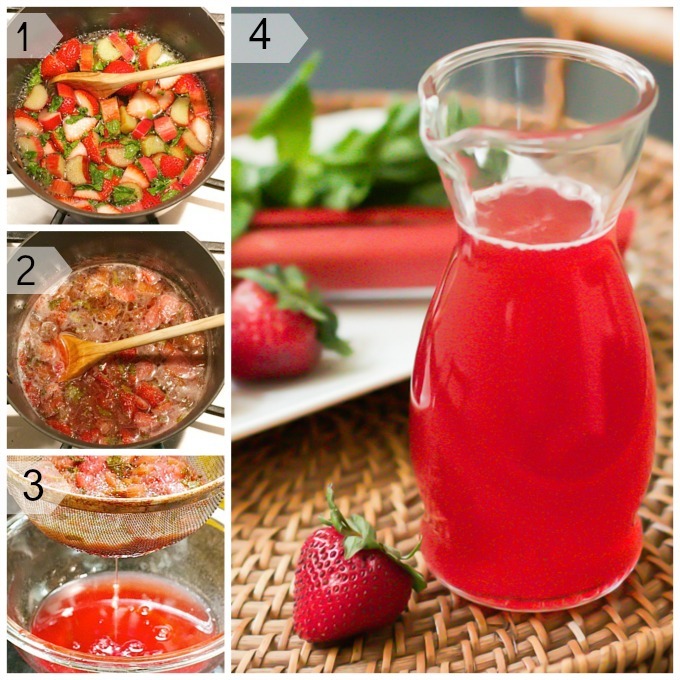 First you start off by making a simple syrup with strawberries, rhubarb and mint. You can read up here for more details about making simple syrup with fruit and herbs. I used a cup each of sugar and water, about a cup of sliced strawberries, sliced up one stalk of rhubarb, and a big old handful of roughly chopped mint. You don’t need to be too concerned about exact amounts of the fruit and mint. Cook it down, then strain it and let it cool. 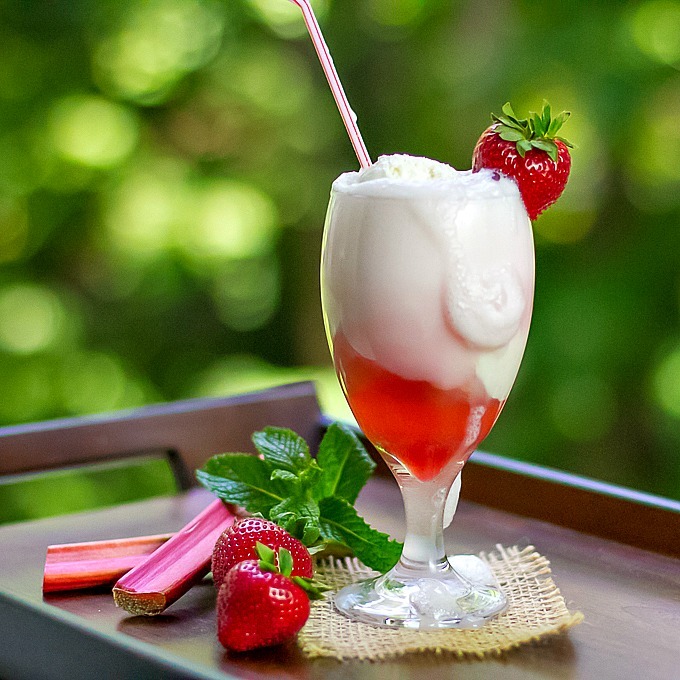 Pour some Strawberry Rhubarb Mint syrup in a glass, top with some club soda and a couple scoops of ice cream. There you have it, a Strawberry Rhubarb Float! If you don’t want ice cream in your drink just pour some Strawberry Rhubarb Mint syrup in a tall glass filled with ice and top it off with club soda. Now you have a Strawberry Rhubarb Spritzer. You knew I’d go there didn’t you? Make a spritzer and add a shot of vodka or rum for a refreshing adult beverage. Or you could even make a martini! Shake up some syrup and vodka or rum in a cocktail shaker filled with ice, then strain into a martini glass! I’d probably squirt some lemon or lime in there as well while your at it (and probably even a shot of club soda), just to help cut down on the sweetness. That syrup is pretty sweet. So there you go. Once you make the syrup, there’s a lot of options for summertime drinks. Why not try some in your ice tea? But it doesn’t have to be for drinks only. Try pouring some syrup over pancakes, ice cream, oatmeal, or plain yogurt! Pour some strawberry rhubarb simple syrup into tall glass. Top with chilled club soda to about ⅔ full. Drop in ice cream. Enjoy! Thank you Allie! I’m in an apartment now and took this picture in the window sill. Luckily I look out to a wooded area, but still wish I had a patio!